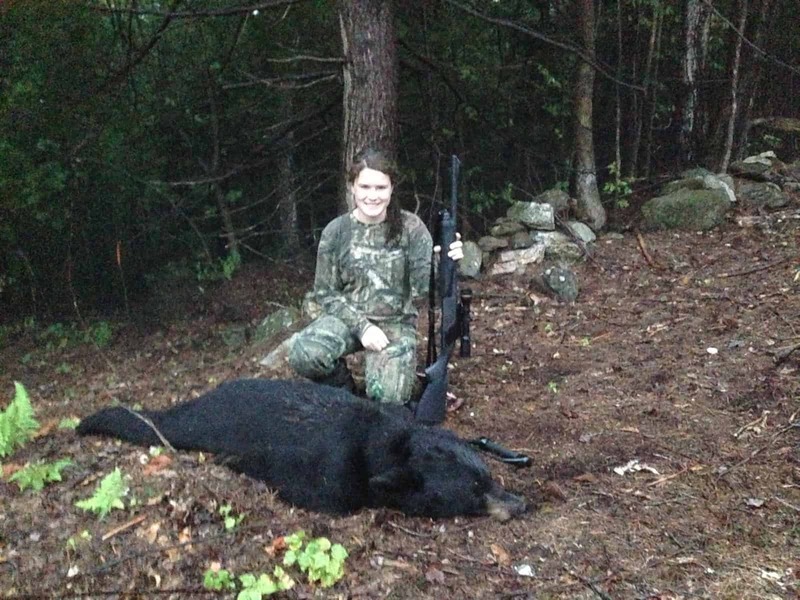 Guest Post: Brandon Reed - Daughters First Bear - the4pointer.com | Real Hunts. Unreal Stories. Over the past month you have seen the picture of Brandon Reed’s daughter Erin and her first bear on Deer Trails over and over because it was a finalist in the Photo Contest. It’s only right that since you have seen the picture so much that you get a chance to read the story behind it! What a hunt and a memory! Our family had our last weekend at camp this weekend and had plans to close up early Monday morning and get home so my oldest daughter could get to a field hockey scrimmage (she made the JV team this year). Given the rain we were having we were all ready to head home. We were unsure if a hunt would make its way into the weekend given the busy schedule and pour weather but it was on the table of options. On my drive home from camp I got a text from a good friend and landowner where we have a bait site and myself and my daughter are on as subs. It said “CALL ME” with a picture attached. I couldn’t make out the picture but knew what was up. Sure enough we had a bear hit the site the first night then again in the morning on September 2nd. Once home I looked over the trail camera pictures and saw it was a decent bear. I quickly checked the weather, checked with my wife and daughter and off we scrambled to get in a hunt. The weather looked like we had a window between 4 and 8 with low chance of rain for the area. We arrived at the landowners and off we went up the hill on the wheeler. We got settled in and buckled up and began our nights sit with just clouds above us. Well it wasn’t long and it began to sprinkle. I looked at my daughter and asked if she wanted to head out..She was fine as the tree canopy was keeping us dry for the time being. Well it wasn’t long and the skies opened up on us and we were in the middle of a downpour. Given the canopy was keeping us somewhat dry for a moment we sat tight.. Each time I said it looked like it was going to let up it rained harder. We were both soaked to the core. I offered again to head out and she decided we would stay given we were already soaked. Not long and the sun peaked through and the rain stopped. We sat soaking wet but spirits high in hopes the bears would move now that the rainfall stopped. A few snacks and some games on the phone helped pass the time. Around 6:35 ish I heard two shots ring out from below in the direction of some cornfields where we know the bears tend to feed. We both looked at each other with a bit of a downer look thinking maybe someone else was hunting bear down at the cornfields. I texted the landowner and asked if he knew of anyone down there hunting bear. I had just gotten his reply that he figured maybe target shooters as they do often or maybe given two shots someone missed. He was trying to keep our spirits high. It wasn’t 5 minutes after those shots when I noticed movement on the hillside out in front of us and quickly picked out the form of a bear coming our way. I told Erin to get her gun up and ready cause there was a bear coming in. She finally picked him out through the trees and we both just watched him work his way in and steadied our breathing.. Or tried to anyway. The bear paused a couple short times before committing and came right in and sat down. Erin was ready and had the crosshairs on him waiting for the clear shot. He was sitting and licking or itching himself so no shot was present but the wind was perfect so we waited for the shot and just watched him. He then stood and presented her with a good quartering almost broadside shot. The angle was great. I gave her the go ahead signal and she let the Remington 870 20 ga fire off. She made a great hit and the bear growled and spun to the ground. I thought he was down for the count right there but then he began thrashing and rolling. When he got some momentum rolling he ended up rolling all the way down over the hillside where he let out some death moans and expired. The hugs and high fives came quick and the reflections of the hunt were shared between father and daughter. It was truly and awesome moment. Erin had finally gotten her first bear and she earned it. She has put in multiple hours on stand last year and the year prior trying the get a bear. The thoughts and dread of being soaked to the bone were a far off memory now. This bear was taken in the same location as my oldest daughters first bear 2 years ago to the day in the same location. It was a boar weighing 140 lbs.